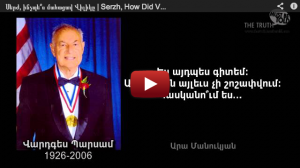 Home » Armenia » Corruption in Armenia » Սերժ, ինչպե՞ս մահացավ Վիլիկը / Serzh, How Did Vilik Die? A few months before his death from cancer, Vartkes Barsam, a well-known American-Armenian benefactor, who was one of the first Diaspora Armenians to extend a generous helping hand to Armenia after the 1988 Spitak Eartquake, gives Ara Manoogian, his friend, a clue about the circumstances of the death of Vilik Harutyunyan, one of Armenia’s prominent, internationally-renowned physicists. He was the founder and the Director General of Laserayin Teknika R&D company.